We build partnerships to help our clients navigate risk and hire great talent. That is our mission. We are looking for a smart, passionate, curious and driven Verification Specialist to join our team. Job Summary: The Verification Specialist is primarily responsible for processing various types of employment, education, professional license and reference verification products related to preemployment, residential and volunteer background screening applications. This position is accountable for working with the Federal Credit Reporting Act (FCRA) regulations to provide accurate background screening results. Must possess demonstrated ability to research and verify information utilizing computer, internet and telephone. Ability to be professional in both oral and written communication. Ability to interpret information received orally and/or written and input into the software system. Ability to multi-task with various types of research throughout any given time. We service a variety of industries with compliant screening and data products all managed through a client-customized interface that allows hiring organizations complete control over the due-diligence process. We reliably deliver verified, compliant results and offer drug testing services at over 15,000 locations nationwide. 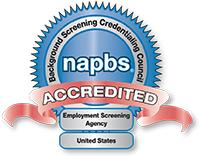 With hundreds of pre and post-employment screening options available, we keep your organization competitive in the search to attract and attain the most qualified candidates.